Data visualization is a powerful tool in the hands of those who try to answer the right question. For some it might be pretty pictures, others might build charts for the sake of it. For us, it’s something that should move minds in the right direction. We decided to show how we use data visualization to solve problems in our day to day work lives. This is the first article where we present how we visually answer questions from our customers and how we come up with new ones. And we answer those as well! The data is real. The insights and conversations are real! We’ve only anonymized the name of the client. I get a call from a client to let me know that things are not working great for them. They wanted us to help them figure out what is not working and offer pointers on how to fix it. The client is an eCommerce store we’re helping with the SEO and analytics part of things. The question is quite broad and without too much detail, which makes things that much difficult. For those of you who enjoy good solutions keep this in mind: the quality of the question determines the quality of the answer. So learn to ask better questions! The complaint came as a surprise to me since I remembered the upward trend in organic traffic. So I fire up Google Analytics and compare the organic traffic for the previous month with the one from last year. The business is fairly seasonal. 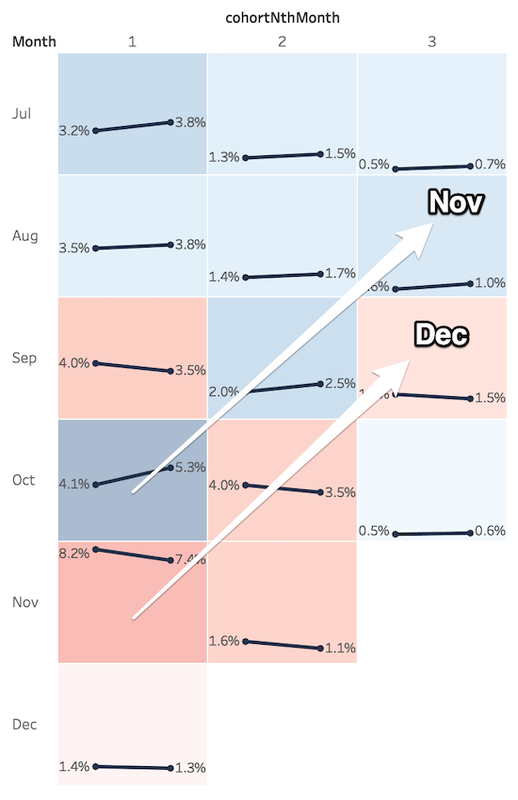 Looking at the data from a Year-over-Year perspective is how we start this type of analysis. The organic traffic is about ~62% higher this year. A lot of SEO/marketing people I know would call the client crazy and move on. If you fall in that bucket, this article is not for you. You can close this page and move on. For me, the analysis is never over that soon. The client might not know what is going on, but a complaint is always an opportunity to learn more from the data. If the client is wrong, we at least have to prove it! The obvious next step for me would be to look at the monthly report we’re sending out. Here we can see the 62% growth in organic traffic and ~11% more conversions. However, what catches my attention on the spot is the ~32% drop in Conversion Rate. Conversion Rate (the number of Conversions per Visit or User) is one of the most common quality indicators for an eCommerce website. Some of the analysts that get to this point might tell the client there’s a problem: users are converting less compared to last year. Fair enough, but we’re smarter than that, aren’t we? Before looking at some custom visualizations, I want you to think about who is converting. Remember that there are real people placing transactions on the website! It might shine a different light on the numbers we’re looking at. First of all, there’s a substantial market trend from which we can’t turn a blind eye. 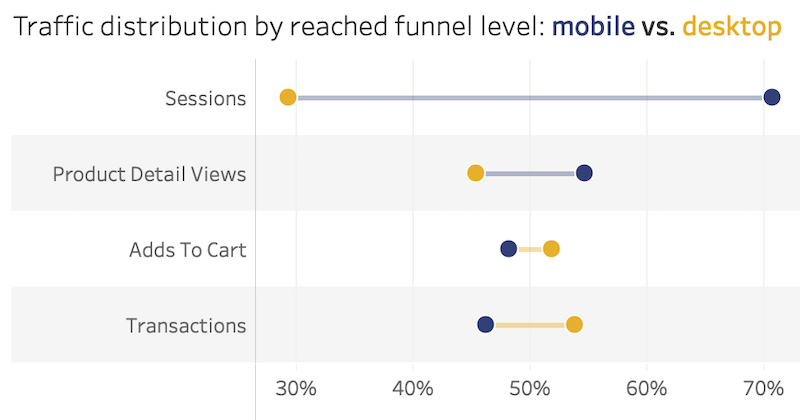 Mobile traffic is overgrowing desktop for most eCommerce businesses. The conversion rate difference between devices is quite significant (2-3 times smaller on mobile compared to the desktop). Also, the mobile conversion rate seems to be on a downward trend. We’ve now reached an improved conclusion: there is a problem with conversion rate on mobile devices. For me, this still sounds like a superficial assumption. Let’s see how we can dig in deeper! Funnels: Where do people get stuck? There are two fundamental approaches to improving conversion rate: reduce friction and intensify the desire. Since the products haven’t changed much, I want to see where the visitors get stuck in their journey. 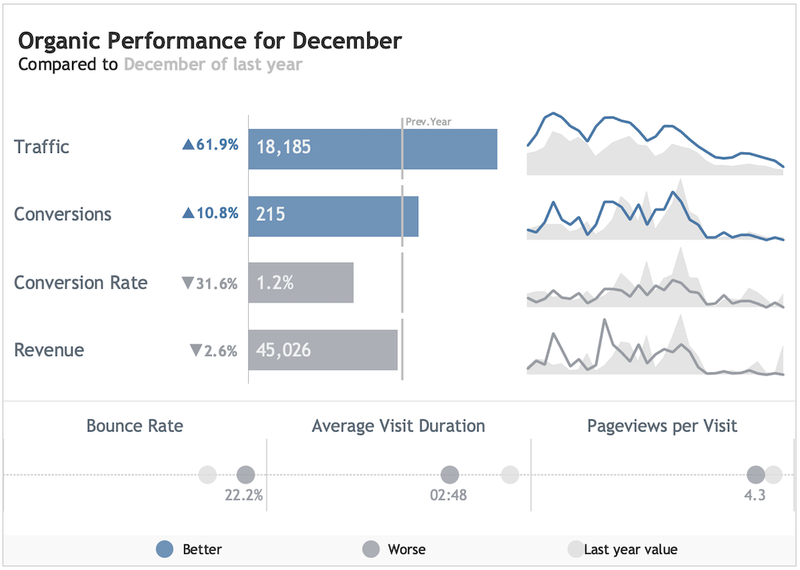 Below is a chart that uses Enhanced eCommerce data from Google Analytics. If you want to learn how to set up such a tracking via Google Tag Manager you can use our guide. 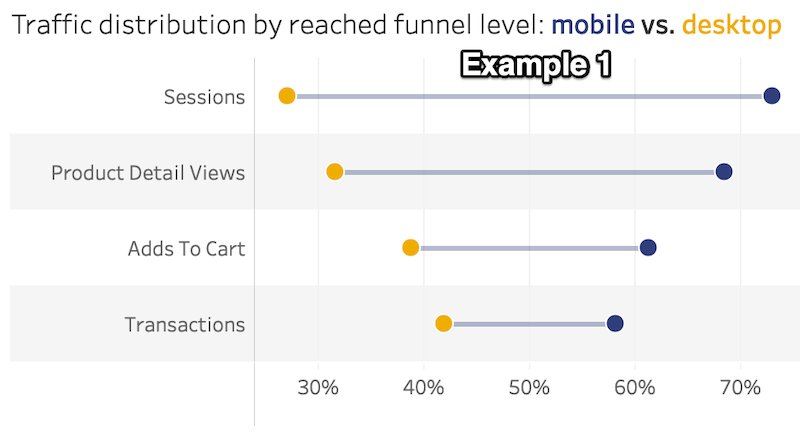 It’s straightforward to notice that mobile starts with a fair amount of traffic and the performance is declining at every step of the funnel. In the final two stages, mobile and desktop are in reverse order contrary to the first two. 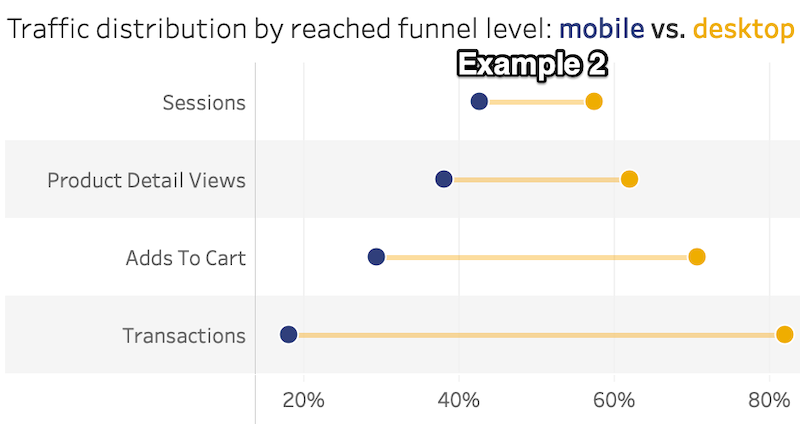 Even though the examples I showed are not addressing the same market, the funnels look a bit more decent. In my opinion, this situation is a clear example of the difference between the “mobile-friendly” and “mobile-first” mentalities. If the data shows that most visitors are using mobile devices, you should prioritize those! Moving on to one more insight! Another particularity of eCommerce is that most businesses are reliant on retention. If customers aren’t coming back, it would be tough supporting the marketing expenses needed to acquire new ones. With this in mind, let’s dissect retention rate! So what better way to do it than by analyzing cohorts (learn more about what you can do with cohort analysis). I’m always nervous before showing such a visualization to a client. It takes some time to explain how to read it, and they might not get it. However, I feel that retention is an important topic, so I took a risk. I was able to clarify that the rows represent the month of acquisition and the columns are months when visitors return to the website. Diagonal patterns are calendar months. If we look at December, we can see how the retention rate is down for visitors acquired in September, October, and November. The client was receptive to this chart after learning how to read it. I even got a question about the magnitude of the decline. When we compare 8.2% with 7.4%, the difference doesn’t seem so important. However, if we do the math, we’ll notice a 10% decrease Year over Year, which is not negligible. After some further investigation, we found out that there were some problems with the retargeting campaigns that should have run in December. Ooops! Not so good for the ones in charge of remarketing, who probably got an earful. It’s good that we got our answer, but it’s even more important to ask questions in a timely manner. Doing the right thing at the wrong time brings in pain. Fixing problems might feel like an endless whack a mole game. What I like about this process is that we can almost always find ideas for improvement. Moreover, since it’s data-driven, we have a better chance of moving in the right direction. 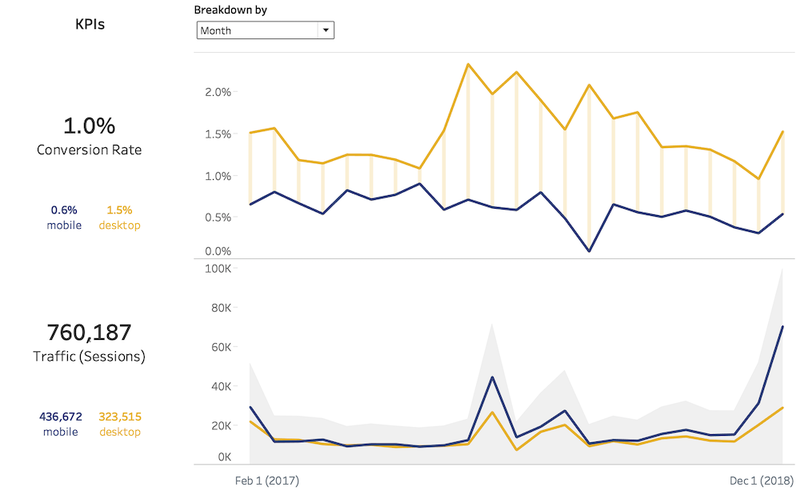 For this analysis we’ve used only Google Analytics data: here’s our process for setting it up and dealing with issues. The custom visuals are built in Tableau, our favorite data visualization tool. Here’s how we can help you with Tableau.